The best rock band in the U.S. right now! I bought the album after seeing them on DirecTV from SXSW and went to see them at Slim's in San Franciso on Wednesday night. These guys and gal rocked. Their stage presence and audience connection is genuine. The band is tight and they have enough uniqueness to stand out. Solid dramatic guitar playing. Great play between guitars, bass and violin (oh yeah!) and I've never seen a electric bass player use a bow. It's a different sound. And, the drummer keeps it all together in just the right way. Let me say that this album sounds great. Producer Pete Min and the band have gifted us with a clean, vivid, compelling mix, brilliantly engineered, in which nothing is lost or buried everything just jumps out of the speakers with sparkling clarity, even at high volume. And you will appreciate the clarity because this is music worth listening to. Initially it struck me as comfort food for the ears, familiar enough throughout but not so overtly derivative as to be cliche. Sure The Toxic Airborne Event has found it's slot in the post-U2, Springsteen arena rock descendants list. No question that you will be reminded in places of Arcade Fire, the Killers and even Franz Ferdinand. Yet The Toxic Airborne Event differs from these bands by filling the space with the intensity of its layers as opposed to the sheer number of layers. The band's less is more approach to ornamentation produces a larger, less distracted final product. Let me also congratulate the band for earning straight A's in Songwriting 101, 201, 301, 401 and Advanced Mainstream Composition. They never stray far from the hooks and, as a result, are radio friendly to go along with arena ready. I don't know if The Airborne Toxic Event's lyrics aspired to be poetry, but they manage to succeed at that frequently. Hard to pick out my favorites but "Gasoline" really jumps, "Missy" and "Something New" both touched me lyrically and how can you not like a song called "Happiness Is Overrated." But it is the album closer "Innocence" that really has The Airborne Toxic Event showing their musical virtuosity and declaring exactly what they want to know about themselves, despite having the shortest lyric on the album. Indie bands start out unsigned and many remain unnoticed in a mainstream that is difficult to crack. The Airborne Toxic Event not only bucked the trend, defied the odds but actually leapfrogged to a point where they secured a major record deal. They faced legions of fans trying to break into the arenas and came up with a monster, Sometime Around Midnight. Mikel Jollett is the lead singer and I have said it before, I hear a little Brian Ferry, Roxy Music in his stylish presentation. I am sure that you will like Innocence, Wishing Well and Papillon which are all indicative of the sheer and appreciated creativity ad intense musical acuity of this outstanding 21 Century band. It is funny, but we are listening to the Killers, Green Day and The Airborne Toxic Music in a surreal sense compares to Paul McCartney singing Yesterday on Sullivan(this only refers to those of us who were there), the rest of the listeners are the younger generation who may be fresh at hearing about the disillusionment that is revolving around. The Airborne Toxic Event is a highly emotional band and very precise about their musicianship. While it is evident Sometime Around Midnight trumps anything the band has ever done I see that only as a positive. It just means to me that everything else is very respectable and clearly the band can come up with three or four cuts like Midnight on a future creation and then we can talk comparison. I won't even repeat them, trite as they are, but the lyrical sin present here is basically what sinks it. It is actually possible to release an album with music as derivative as this IF, and those capital letters exist for a reason, IF the lyrics don't make the listener wince. If you remember Jesse Malin in D-Generation in the late-90's, or BuckCherry, or even Arcade Fire, you can pretty much a be a jukebox of what popular guitar-rock sounded like 5 years before your album came out, but for Allah's sake don't phone in the vocals from a pre-teen's spiral notebook. I actually enjoyed the overly familiar music of this release, but the Strokes-meets-Kaiser-Chiefs vocal delivery pretty much ruins it with some of the most shallow lyrical exploits this side of High School Musical 3. Which is kind of a shame, as the music flails around in enough proven ponds to come out on top occasionally, only to be terminally submerged in verbal fluff. These guys won't be around long. I had an opportunity to read the lyrics for Airborne Toxic Event's debut album (three of the songs appeared on an EP) before hearing the majority of the songs, and I found it interesting that rather than print the lyrics in verses as one would expect, the booklet contains transcriptions in prose, ignoring the line breaks as Jollet articulates them in song. Apart from the music, one sees in the lyrics fairly common sentiments expressed in a fairly common way. The closing lines of "Happiness Is Overrated," for example, look as if they reach for rhyme rather than other expression: "Or just alone instead, I'll be alone instead. I don't need anyone in this bed. Just these ceiling tiles falling through my head. Sorry. I really lost my head. I'm so sorry I really lost my head. Oh, those words you said." The opening of "Papillon" follow a similar pattern: "All dressed up, no place to run. No car. No girl. No pills. No fun. Nothing to do in this empty room. I've got to get my head together soon." Even one of the stronger songs on the album, "Wishing Well," contains sections like "And the air is thin and it blows through your skin and you feel like something is about to begin but you don't know what and you don't know when, so you tear at your hair and you scratch at your skin." The result, in print anyway, is a type of singsong pattern, with predictable phrases and rhymes, with little specific or personal or idiosyncratic about these lyrics. Especially in the beat-heavy songs, the sound of the words becomes more important than the message of the lyrics. That is unfortunate, because there are some nice lines in this album. In "Sometime around Midnight," for example, a desired woman is described as "holding her tonic like a cross," which offers a compelling blur between addiction and devotion. These lines get lost in the easy rhymes, the familiar patterns, and the generic cries of anguish that occur from song to song. The occasional surprise (just what has happened--what is confessed--in "Something New," for example?) and the deceptive playfulness of "Missy" are counterbalanced by the awkward phrasing of lines like "And the piano's this melancholy soundtrack to her smile in that white dress she's wearing, you haven't seen her for a while" ("Sometime around Midnight"). Listening to this album gives the impression that sometimes words matter only part of the time. As far as the band's sound goes, they seem to have been influenced a great deal by the Strokes, but with a nod to grand gestures of stadium-filling bands, taking risks in instrumentation and production in many parts of the album. 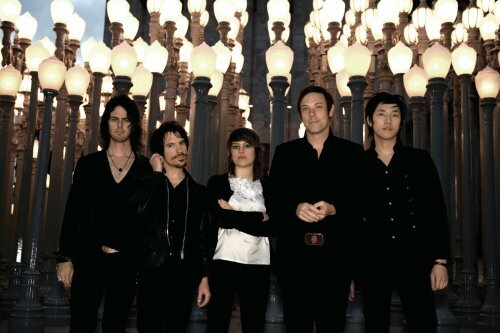 The Airborne Toxic Event formed in LA some 3 years back and after quickly gaining attention on the concert scene in Southern California, and the release of an EP in 2007, now finally comes the debut album. "The Airborne Toxic Event" (10 tracks; 38 min.) starts off with a tentative "Wishing Well", but then kicks into overdrive with "Papillion" and an even better "Gasoline" (1st UK single), both of which immediately remind of the Strokes, with high energy, guitar-driven pulses. The songs come fast and furious. "Happiness Is Overrated" expands the musical gamet a bit, sounding great. The first half of the album concludes with a short but equally "Does This Mean You're Moving On". Wow, what a great start to the album. I rate the A side 4.5 stars. The second half kicks off with a whaling "This Is Nowhere", which just grabs you. After that, though, the album starts to falter a bit and loses some of the great energy from the first half. The more pensive (and much longer) "Sometime Around Midnight" is a misfire and sounds out of place with the rest. "Something New" is the last highlight. I rate the B side 3.5 stars. I typically wouldn't launch into a new band without wetting my feet first, but I happen to have done so here, and though it's fairly rare, this has been pleasantly surprising. There's quite a dearth of catchy, melodic rock with pleasing rhythm around these days, at least from the new artists. Many young bands seem to feel a slightly off-putting ambiguity is necessary to be taken seriously. Not so here - these guys go straight-up, loud and unafraid. I'm giving the majority of stars in my review to the sound, because it's great, and there isn't enough of it. 3.5 stars - a solid album, but not particularly amazing. Airborne Toxic Event's self-titled debut is not an amazing album, but it's a good album. It's notoriously scathing Pitchfork review might have you believe that it's the worst album ever made, but that review has a lot more to do with posturing on the part of the reviewer than an actual critique of the music. The only thing I can say is that Pitchfork has reached a new level of pretension and I wouldn't let it dissuade you from giving ATE a chance. Yes, this band is not original or unique. They fit squarely into the Indie Rock mold, but they do it so well that it's not a big problem for me if they don't redefine the style. I think it's perfectly fine to work within a well-defined style, so long as the music is good. The lyrics are pretty generic, but Mikel Jollett has a good voice that works well with the sound of the band. When I feel like I've heard just about as many soft, wispy male vocals as I can stand, ATE sounds refreshing with a slightly harder, more rocking edge. For example, the lyrics to "Sometime Around Midnight" are just really obvious; however, I recommend not even listening to them. The song is very nice if you just take in the music and don't worry about the lyrics. It creates a wonderful mood and has a nice dramatic contour. This is the best new artist out.